Google collaborated with AKQA San Francisco, PostPanic and Rehab to create a 10th anniversary film to thank Google AdWords clients around the world. Susan Wojcicki, senior vice president for Google Adwords, is joined by a representative of a fictitious Google research department trying out ambitious experiments to feature each advertiser. At the end a simple thank you is all you need. The spot includes footage filmed in and around Google Hdq and San Jose Airport in California. The spot was customised for each customer with brand names inserted in the shape of thousands of lights, swarming spelling bees, dominoes and the surface of the moon. The 10 Years campaign is centred on the Adwords10 Youtube Channel, produced in over 40 languages, in which customers submit their own success stories. The specially created system first uses geo-tagging to track the customer’s specific location, pinning their uploaded story to the channel’s 3D globe. The system then automatically visualizes their content within a Google Maps backdrop. The channel also allows users to compare a rich series of business and consumer facts demonstrating the power of Adwords with data represented visually on a 3D globe, filterable by theme, sector and country, delivering a highly targeted, visual resource. 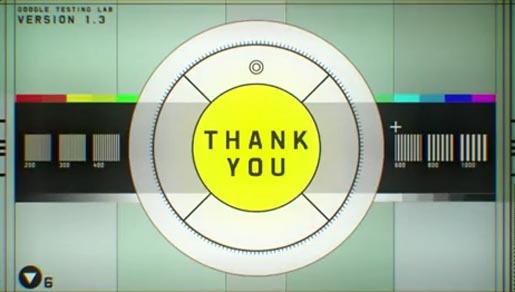 The Thanks video was developed at AKQA by group creative director Neil Robinson, copywriter Vinit Patil, executive producer Nancy Cardillo, account manager Christina Wong, working with Google’s Head of AdWords Product Marketing Jon Diorio. Filming was shot by director Mischa Rozema via PostPanic, Amsterdam, with producers Nancy Cardillo, Joy Czerwonky, Ania Markham and Jules Tervoort, director of photography Joost van Starrenburg, and editor Rocky Bazemore. Digital post production was done at PostPanic by editor Rocky Bazemore, CG Supervisor Ivor Goldberg, VFX Supervisor Chris Staves, matte painter Wieger Poutsma, 3D artists Jeroen Aerts, Matthijs Joor, Adam Janaczek, Simeon Patarozliev, Jurriën Boogert, Marnix Reckman, Luc Thijssen, Ruud Coenen, 2D artists Erwin van den IJssel, Giso Spijkerman [matchmoving] and compositor Chris Staves. Rehab, London, added the technology to personalise each film with the advertiser’s name.